Wow, I can not believe that we are only 4 sketches away from 100 sketches! I am going to have to think of something to do to celebrate that milestone! Any ideas of what to do? I actually had a bit of a hard time with this week's sketch at first but then I just moved the tag a bit and now I like it. 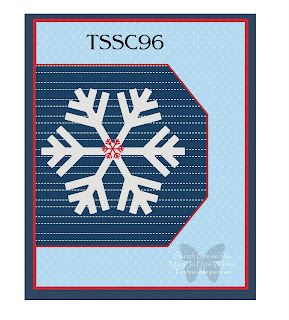 As usual I am combining my sketch challenge with the Latenightstamper's weekly challenge--this we we are to make cards for our favorite holiday! Could be any holiday but what holiday is better than Christmas? The day our Lord was born the excitement of all the children, the fun and festive energy all over the place! I just LOVE Christmas. My cards also fit the SUDSOL set sampler challenge for the week which is Scenic Season. So without further jabbering I will get on to this week's Technostamper Monday Lunchtime Sketch Challenge #96. I hope you will chose to play along, I love seeing what you come up with. Please come back and add your link to Mister Linky at the end of this post so that you can be included in the recap on Sunday Night. 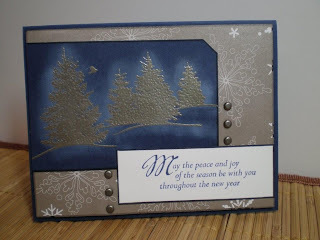 Other: mixed embossing powder (silver with a touch of gold), heat gun, brads, marker for edges. Wow! Both cards are amazing, I love the trees with the navy background! The 2nd card is equally as beautiful. Great job, I kept on wanting to do this but have been working on some other things so haven't had a chance to play in awhile. We've got the retreat info posted...hope you'll be there, would be great to see you again! I love what you did with this sketch! 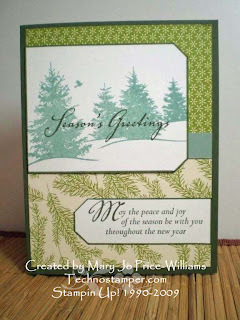 Especially the first card with the Lovely As A Tree, that is beautiful! I like this sketch - it's going to stretch my creativity today! For your 100th sketch, why not try to collect 100 cards to donate to troops, a nursing home, or some other worthy group? Beautiful cards. I really like your 2nd card. Well if I had to vote I guess I'd go with your Season's Greetings. I got to play with it too--I did not change much from your sketch because I just love it the way it is! Added my name to Mr. Linky. Thanks for the inspiration Mary Jo! I loved playing along!